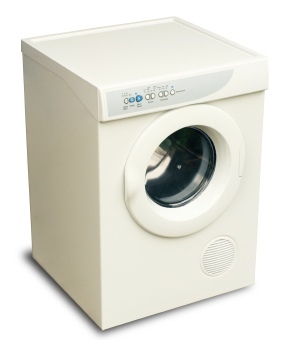 A clothes dryer or tumble dryer is a household appliance that is used to remove the moisture from a load of clothing and other textiles, generally shortly after they are cleaned in a washing machine. Most dryers consist of a rotating drum called a tumbler through which heated air is circulated to evaporate the moisture from the load. The tumbler is rotated relatively slowly in order to maintain space between the articles in the load. In most cases, the tumbler is belt-driven by an induction motor.